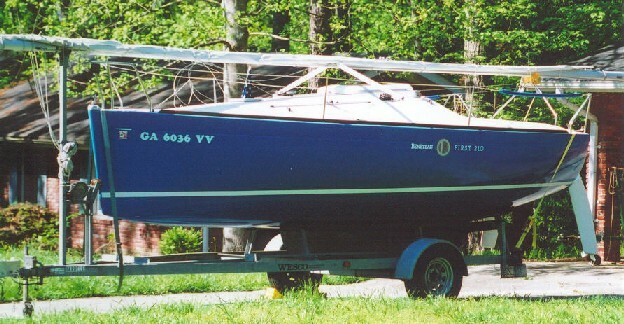 Hull #14, 1993 model year. Excellent condition, all original equipment, well maintained. In 2004 the bottom was "race prepped" by Weathermark Sailing Center with 5 coats of Expory Barrier Coat and top coated with VC Offshore hard teflon paint. Bottom is currently in excellant condition. Brightwork has been refinished and maintained with Cetol Marine finish and is currently in good condition. Hull exterior has been maintained with Starbrite Teflon and is currently in need of buffing and polishing. Sails are original Doyle main and jib and are old but in generally good condition with signs of wear. They are not "race quality" sails by any standard, but are very useable. Interior is all original, no upgrades. Interior cushions are in "like new" condition. Trailer is original Westco brand galvanized with 5300 lbs capacity Spindle-lube axle and Tie-Down brand (OEM) disk brakes. Wheel bearings and seals were last overhauled summer of 2006, and new springs and bushings were installed at that time. Full size spare tire. Motor carrying bracket on tongue. Trailer is completely road-ready. Complete OEM mast-raising system is included. NO LONGER FOR SALE at this time! OSYC club race, September 2003. Trailer Sailor Cruise, April 2002. Installation of Disc trailer brakes, January 2002.